Want to stay in shape this winter? Hit the gym! New to Rosslyn in 2018, BASH Boxing offers group workouts combining boxing and High Intensity Interval Training (HIIT). Their 45-minute classes help ensure participants burn maximum calories, build lean muscle and improve balance and agility. Workouts use water-filled Aqua training bags and top-of-the-line strength and conditioning equipment. First-timers can book a free class to try it out. When you're ready to sign up, BASH offers monthly memberships and class packs. Sign up for a free class or review membership options here. CrossFit consists of constantly varied movements (e.g., pushing, pulling, squatting, lifting, running) executed at a high intensity. If it's your first time, you'll start with a consultation, and your first workout session will be free. Next, you can sign up for foundation/group classes where you'll learn the basics of CrossFit. These classes are not required but highly recommended for anyone new to CrossFit, even seasoned athletes. After you feel comfortable with the workout, you're ready to join their Workout of the Day (WOD) classes. Classes are scalable to meet your fitness needs. You'll also be able to enroll in personal training, which will also help you become familiar with the CrossFit movements. Monthly membership prices range from $94 (four classes per month) to $219 (unlimited classes per month). You can try out a free intro class by clicking here. E60 Fitness opened in Rosslyn in June 2017. A high-intensity multi-functional workout class, Elevate 60, is their core offering. Elevate 60 covers several exercise disciplines including cardio intervals, strength training, and functional training in a single workout. The class is offered several times a day on a recurring schedule, but the exercises and stations within the class change daily so the workout is different every time. E60 Fitness uses wearable heart rate monitoring devices throughout their classes so participants can track their progress on screens throughout the studio in real-time. Their no-contract membership plans are affordable and flexible. Clients can also purchase packages of classes that are valid for a full year. In addition to group classes, E60 Fitness also offers personal training, couples training, and small group training. E60 currently offers a week of free classes. You can sign up for your free week here. The Rosslyn location of Gold's Gym offers a variety of classes and amenities, including a steam room/sauna, resistance machines and free weights. Class offerings include Bootcamp, Vinyasa Flow Yoga, Barre, Cycle, Step, Pilates, Kickboxing, Zumba and more. If you're a new client, you'll get started by building a fitness profile that enables you to set goals. You'll be able to consult with one of Gold's personal trainers in developing your plan. If you want to try it out first, you can take advantage of Gold's free guest passes, accessible here (scroll down to the bottom of the page to fill out the form). Membership prices range from an "Access" three-month membership at $39.99/month to a month-to-month "Studio" at $99.99/month that includes unlimited access to Gold's enhanced training programs. LavaBarre is a fitness boutique that offers a multidisciplinary, cross-training schedule in an intimate and luxurious setting. Clients choose from classes taught by leading instructors in their field who push them to achieve results in three studios: two offer barre, yoga and TRX and one boasts heart-pumping cycle. LavaBarre offers a variety of membership options. If you're a new client, staff will work closely with you to match you with the best plan, whether it be an unlimited membership, a reduced membership that enables you to come once or twice a week, or a package of 10-20 classes. The studio also provides amenities such as full-service locker rooms with towel service and Red Flower bath products. Through training with heart rate monitors, Orangetheory Fitness helps ensure that participants achieve maximum metabolic burn. Their Rosslyn studio includes 12 TRX suspension unit systems, 12 treadmills and 12 indoor rowing machines. Orangetheory Fitness offers 60-minute workout sessions split into intervals of cardiovascular and strength training with heart rate monitors to track intensity and maximize metabolic burn. Workouts are designed to help you increase energy, get visible results and burn more calories, even after leaving the studio. The Rosslyn studio features 12 TRX suspension unit systems, 12 treadmills and 12 indoor rowing machines in addition to enough benches and free weights for sessions of 20-30 people. 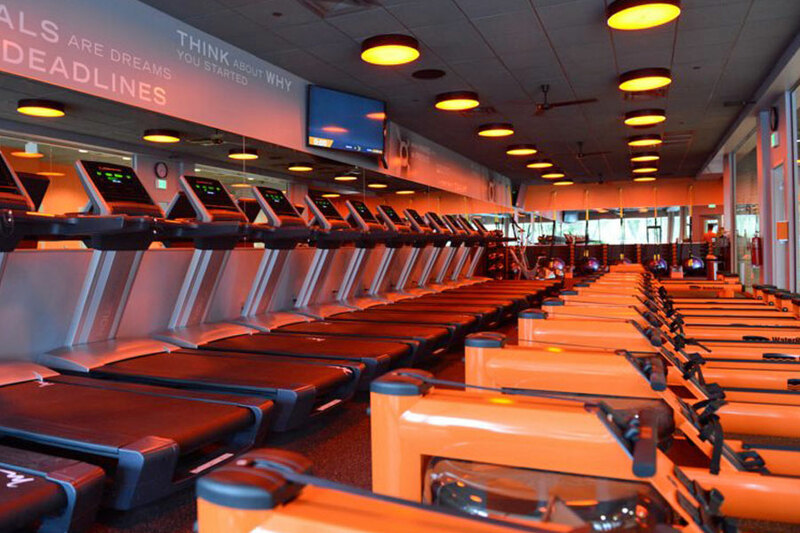 Orangetheory offers monthly memberships with no annual commitment required. You can sign up for a free one-hour workout here. Verve Health & Fitness specializes in customized personal training across all fitness disciplines. Their team of trainers is highly regarded and sought after by Washington-area athletes, executives and celebrities. Besides seeking training, if you're a prospective member, you can sign up for packages of group classes ranging from eight classes per month to an unlimited number. Verve offers dozens of options, including a pure strength class, Tabata, boot camp, TRX, HIIT, precision running, yoga, Pilates, cardio kickboxing and more. Although Verve is co-located with CrossFit Rosslyn, group membership packages do not include CrossFit Rosslyn classes. Anytime Fitness is a local coaching community fitness club with 4,200+ locations all over the world. They plan to open in Rosslyn in March 2019. Anytime Fitness offers 24/7, 365 convenience, group and personal training, brand-new, top-of-the-line fitness equipment, an app to help you achieve your goals, and a diverse and supportive community. Get in on their presale that's currently taking place at Spaces, 1101 Wilson Blvd. They guarantee you'll get the best opening specials available, lots of swag and the chance to win some great raffle prizes. Drop by their table in Spaces' lobby or in the Deloitte lobby (1919 N. Lynn St.), get in touch via email here, or give them a call at 571-339-1919. Participants at the 2nd Good Sweat Sesh take their workout off the bike for a bootcamp at Gateway Park. The Good Sweat Cycling Studio, which will open in Rosslyn this spring, is currently having a presale. 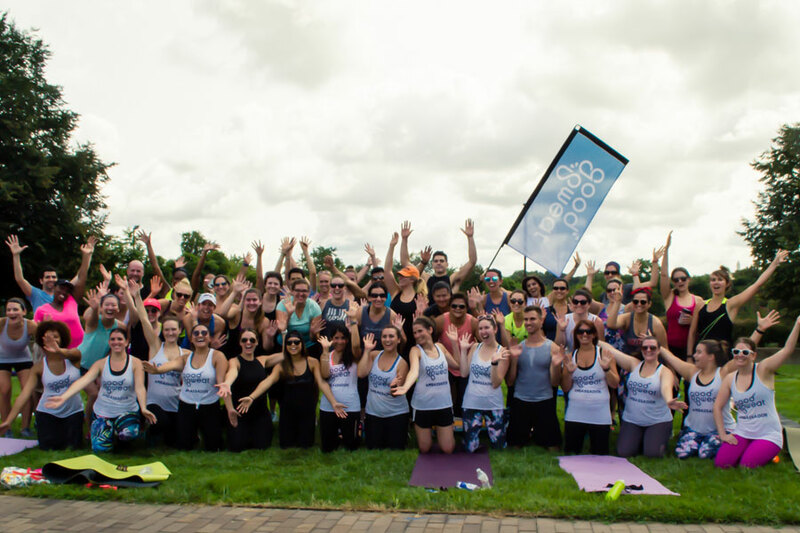 Opening in Rosslyn this spring, Good Sweat is a brand-new cycling studio, locally owned by Arlington instructor Ali Hashemi. This studio will offer invigorating and motivating cycling classes taught by experienced instructors. Good Sweat seeks to make your workouts meaningful in more ways than one: The studio pledges to invest a portion of every purchase you make at Good Sweat back into the community. Click here to check out their presale deals, including $1 unlimited access during their soft opening week. Photo at top: Working out in one of LavaBarre's three studios. Besides barre, the fitness boutique also offers TRX, cycling and yoga.